W3capture for Mac is a webpage, html, htm and TXT files capture tool on Mac that enables you to create thumbnail images or take full size screenshots of webpages, html, htm and TXT files. It is a professional software to convert webpages to PNG, JPG, BMP, SVG and PDF. 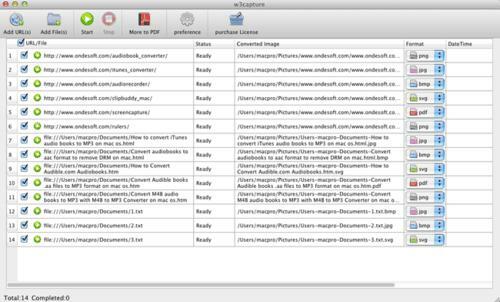 – W3capture for Mac allows users to capture entire webpages in the form of PDF files – nomatter how long the webpage is. – Multi-threaded batch conversions allow the user to convert an unlimited number of different webpages from different URLs in to ONE PDF file. – Ondesoft W3capture can also convert any number of different webpages to their own separate PDF or Image files,at the same time. – Ondesoft W3capture works fast, real fast – save entire webpages to PDF files in seconds!